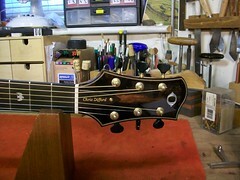 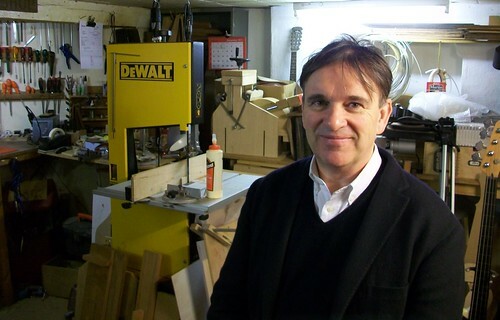 This Olson is owned by Chris Difford. 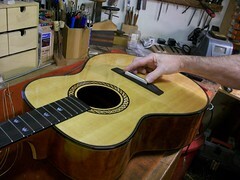 It’s in the workshop for a new pickup system and it’s needed fairly urgently for an up and coming tour. 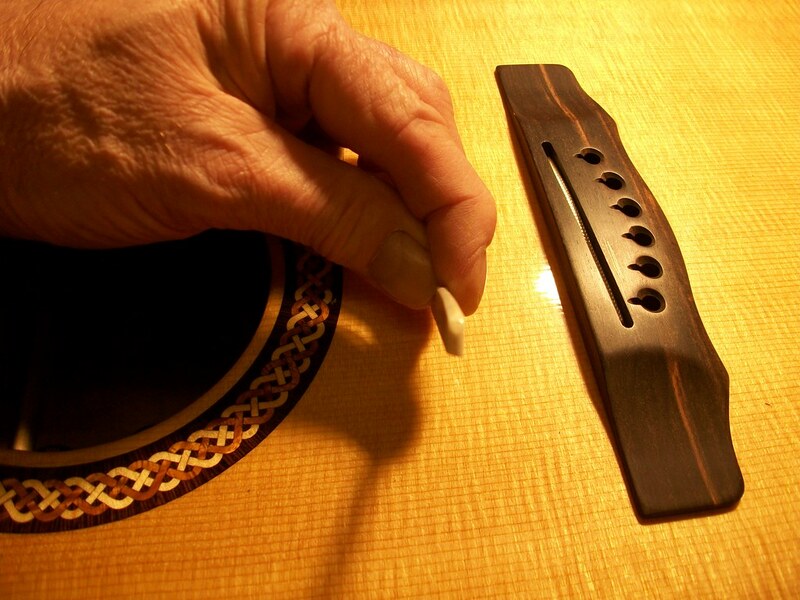 The old pickup is a passive system and an active pickup is needed to boost and enhance the beautiful acoustic quality of this guitar. 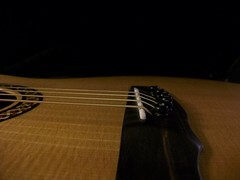 The guitar was made in 2007 and in its short life span the technology of acoustic pickups has come on leaps and bounds. 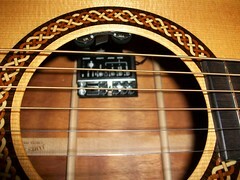 The L.R.Baggs iMix is the preferred choice for this Olson. It will combine the warm, positive sounds on the undersaddle pickup with the natural and sumptuous tones of the soundboard mounted iBeam pickup. 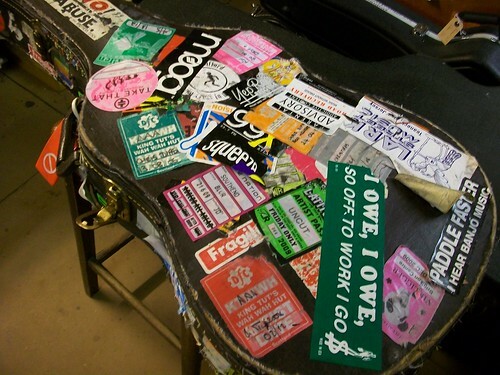 The old pickup system is removed. 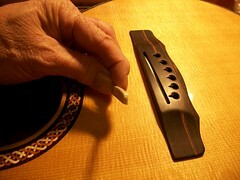 It’s the early type of pickup that is combined and manufactured into the saddle. 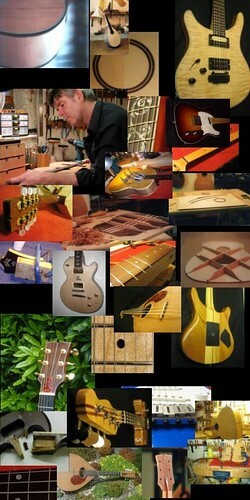 Once removed a new saddle substitute will need to be made. 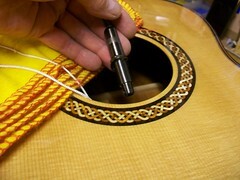 Before removal, measurements are taken of the string and the saddle height. 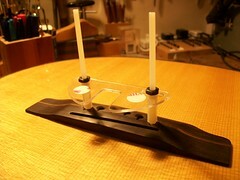 This is to ensure that the playing action is matched once the new saddle is made and installed. 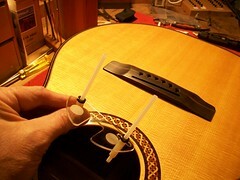 The mounting fixture is fed through the soundhole and the vertical posts are brought up through the outer bridge pin holes. 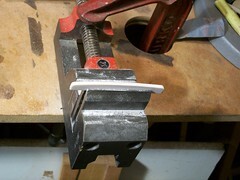 This ensures the iBeam is sitting directly under the saddle. 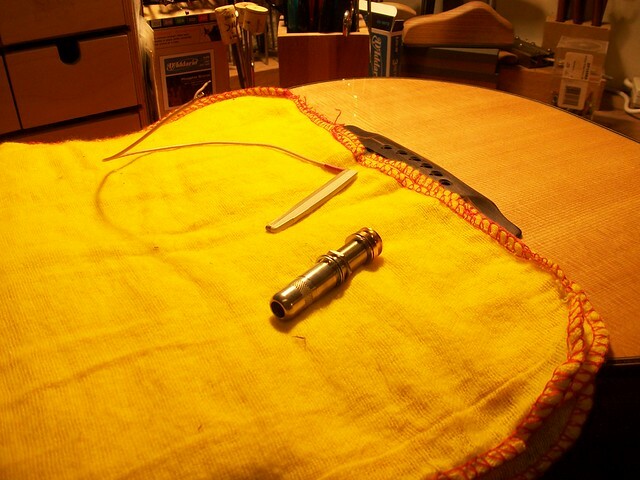 The undersaddle element is fitted into place…. 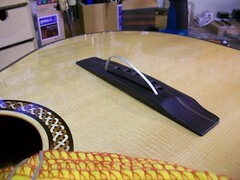 …the bottom of the saddle is cut with a slight angle. 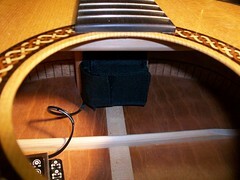 The saddle is made so that it fits loosely into the saddle slot, this is to maximise the transferral of string vibration to the pickup element. Consequently there is a slight forward tilt to the saddle once strung-up. 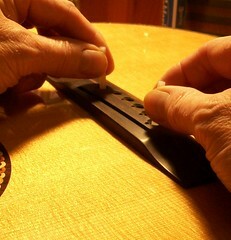 The angle cut to the bottom of the bone saddle will ensure that there is maximum contact between saddle and element. 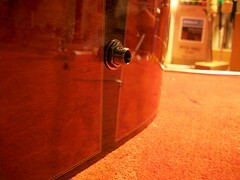 All internal wiring is tidied and secured to the guitars internal walls. 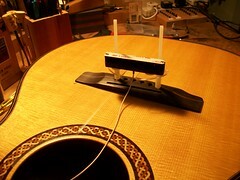 The guitar is strung-up and tested. 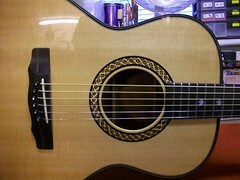 The new pickup system sounds great and will enhance and complement the acoustic value of this beautiful guitar in any live performance or studio situation. 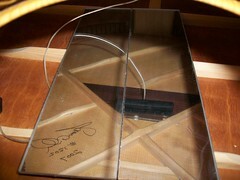 Cased up and ready for collection.